Organize your trade show booth and make the best first impression possible by adding one or more trade show accessories. Purchase or rent one or more of our trade show accessories to enhance your booth. Utilize one or more of our trade show kiosks to showcase a video display, feature marketing graphics or spotlight a new product line. Our trade show kiosks come in a variety of configurations and when coupled with custom-graphics enhance your corporate brand awareness within your trade show booth. E&E Exhibit Solutions offers a variety of trade show counters for rent. 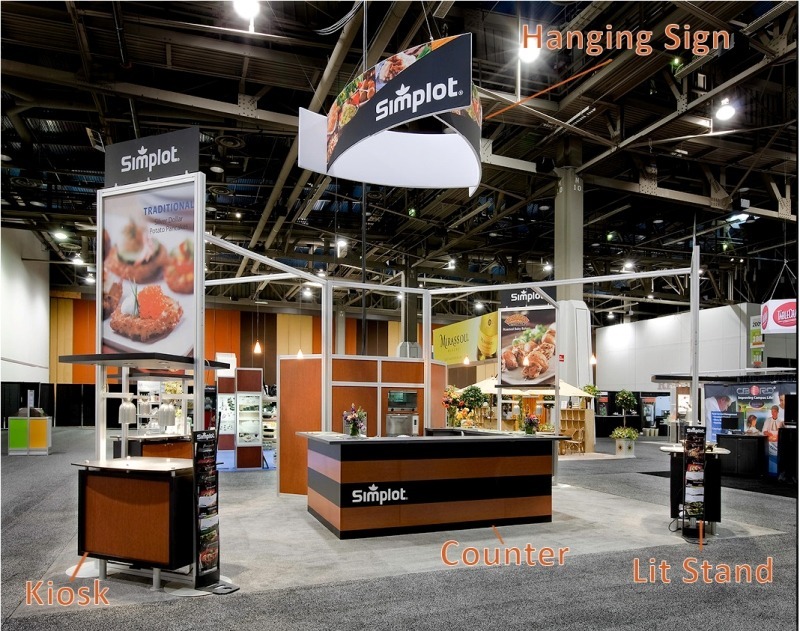 Our selection includes trade show counters that include locking cabinets, shelving for storage and wide, welcoming counter tops with room for additional products and marketing materials. Rent one of our trade show counters and choose from a variety of wood finishes, sizes and configurations. Help exhibitors easily find your booth by renting one of our trade show hanging signs. Our hanging signs visually broadcast your logo and marketing message from one end of the convention hall to another. Choose your hanging signs from a variety of shapes and sizes. Perhaps our lightest weight and easiest to manage trade show accessory is our collection of retractable and 30-second set up banner stands. Choose from a variety of banner stands- tabletop, retractable, pop-up and double-sided units. We’ll print your marketing message or our Graphic Design specialists will create banner stand graphics with your target message. Rental Add-Ons: Trade Show Furniture, Literature Stands and more! Choose from an endless array of trade show accessories all available to rent or own. We offer a selection of trade show furniture to complement your trade show booth. Our Literature Stands conveniently and professionally display your marketing collateral, brochures, DVDs and other giveaway literature. Need extra shipping cases? E&E Exhibit Solutions has a selection of durable boxes and trade show cases for shipping and storage.